With more than 35 years of combined Real Estate experience, who better than SanCap Gateway to help you purchase or sell your property? We live in a seller’s market, why squander it? View some tricks of the trade to help you get top dollar when selling your home. Curious about your home or condo’s current value? Get a no hassle FREE home valuation email to you in a matter of minutes! 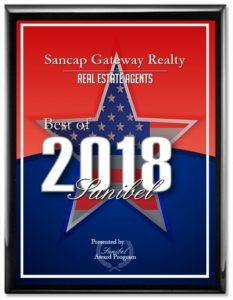 Sancap Gateway Realty Receives 2018 Best of Sanibel Award! Sancap Gateway Realty has been selected for the 2018 Best of Sanibel Award in the Real Estate Agents category by the Sanibel Award Program. Each year, the Sanibel Award Program identifies companies that we believe have achieved exceptional marketing success in their local community and business category. These are local companies that enhance the positive image of small business through service to their customers and our community. These exceptional companies help make the Sanibel area a great place to live, work and play. 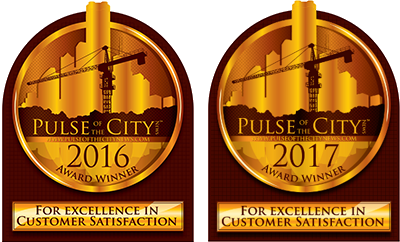 Pulse of the City Award Winner for 2016 and 2017! Based on the independent research of The Pulse of the City News, SANCAP GATEWAY has won the coveted STAR AWARD again in 2017 by combining superior product & excellent customer focus! Read more here. SanCap Gateway Realty, Gateway to the Islands. We are located next to the Sanibel & Captiva Chamber of Commerce, just past the Causeway on Sanibel Island.With more than 35 years of combined Real Estate experience, who better than SanCap Gateway to help you purchase or sell your property? My wife and I want to thank SanCap Gateway Realty for the great experience we had when selling our condo at Sanibel Arms West. Lori took care of it all from appraising for a price that was more than we expected to "baby sitting" us until the transaction was completed. The price was attractive to the buyer and we were very happy to accept! We think you will enjoy your involvement with Lori as much as we did! SanCap Gateway Realty was very efficient and professional when working with me in early 2018. My condo was sold in 3 days! I would recommend SanCap Gateway Realty to anyone. Being from out of town, we needed a realtor we could trust. A realty company that would put a fair and realistic price on the condo and not just tell us an inflated price to get us to sign. San Cap Gateway Realty was just the realty company we needed. From beginning to end they made the long distance sale very easy. And more important, everything was accomplished on time. Lori is a very caring and wonderful person to list a home through! She went over and above for me and got what I needed for my property! She was there every step of the way.The virtual tour was excellent and even though the "season" was pretty much over when I listed, she got the property sold. You can't go wrong with Lori and SanCap Gateway Realty. Hi Lori, Thank you so much for the housewarming gift tote. I love Tervis glasses and have never seen any with the Sanibel map. So cute. The little notebooks have come in handy already so I can keep track of what I brought down here so I am not turning the house upside down in Michigan looking for something that is already here. And of course, you can never have too much champagne or too many beach towels. Thanks again, for all of your help and the generous gift tote. Looking forward to seeing you in "season" for lunch or dinner. I will not hesitate to recommend you should any of my friends decide to buy (or sell). Thank you SO MUCH for selling our condo! We appreciate your help, your hard work and your professionalism. As much as we liked owning at SAW, it is a relief to have the condo gone now that I have my mother here for the winter full time. The next time we come, we will enjoy being carefree renters on Sanibel! I have worked with Lori on several land transactions. She is best. Lori is very responsive and is a pleasure to work with. Her experience and knowledge is second to none. When we were in the market for a home in Sanibel, FL, Lori was our "go to" Realtor! She made the whole process of purchasing a home in Sanibel while we were still living in New Jersey, a breeze! We are extremely satisfied with the great job Lori did for LIS. She is the Realtor to go with! It was a great experience buying my first home with Lori. This is someone you can trust to walk you through the process and find a good home. She works with trusted partners and home inspectors. Lori can work a contract and find any lose ends to protect her clients and find you the best deal. 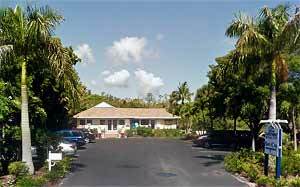 Lori has been helping us find the "right place" on Sanibel at the right price. We have been taking our time to find that "right place", and Lori has always been very patient, very helpful and very knowledgeable. We are glad to be a client of Lori, and look forward, with her continued help, to finding the "right place" for us on Sanibel. Lori is an excellent agent. I have been working with her for years and she has done an amazing job. Click here to to view full testimonials.